Once upon a time we handled books. We actually touched them. Books were made for us to play with and reading was tactile. Then we grew up [=no more pictures, no more furry felt animals or scratch & sniff treasures awaiting us at the turn of the page. No more when you hear the chimes ring, like this... no more cut outs or pull tabs or bonus sticker pages]. But wait, grieve not weary adult! The tactile reading experience is not behind you, it lies ahead. Our books are made for your amusement and visual pleasure. Someone is still thinking of you when they make books. 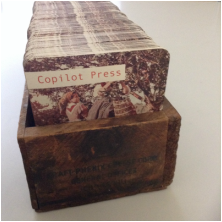 Copilot Press is publishing as an arts practice. 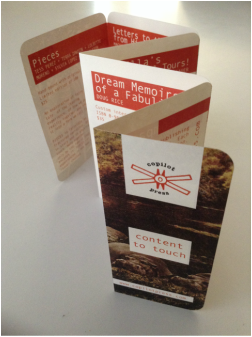 Each book is a collaboration between content and designer. Book artist Stephanie Sauer began by working in dialogue with the manuscript and the book as form, creating one-of-a-kind structures designed to let the content of each book bleed out onto your palms as you handle it, read it, interact with it. Today Copilot is making room for emerging talents like Jonathan Alston to take the creative reigns, beginning with Pieces. Continuing in the traditions of independent publishing, our books are produced largely by hand, in a collaborative setting, and always with care. Copilot publishing and distribution methods vary according to each piece. All materials for our books are printed as locally as possible. Copilot Press was delivered parcel post to a Chicago apartment complex sometime in early 2008 inside a box containing 508 original works by General Esteban Villa with signed permission to publish as desired. Upon inspection, we unfolded it, excavated a blank field guide and got to work making the first in a series of books whose forms would meet the spirit of the work they encased or expounded.